MMA fighter Dae Hwan Kim (left). 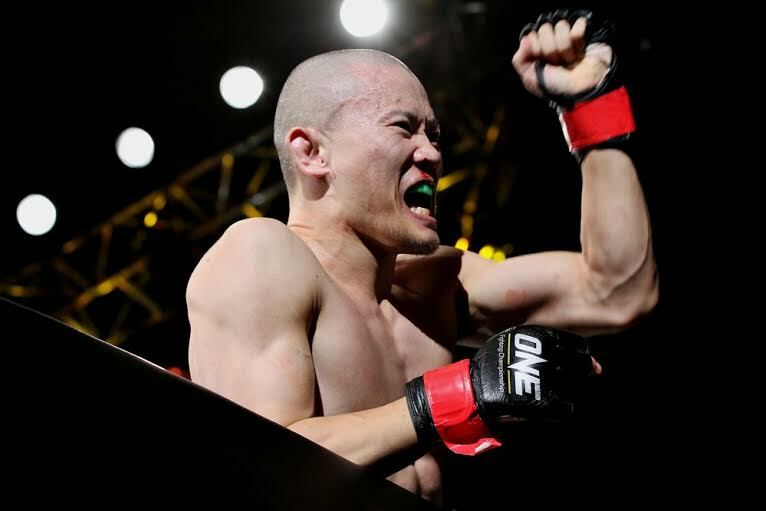 Dae Hwan Kim and Koetsu Okazaki have proven tough in the bantamweight division before. Now, the two veterans will collide at ONE: DYNASTY OF CHAMPIONS (SHANGHAI) on 1 September 2015 at the Mercedes-Benz Arena. The card features a main event between ONE Middleweight World Champion Igor Svirid and challenger Vitay Bigdash. The last time 28-year-old Kim stepped inside the ONE Championship cage, he challenged Bibiano Fernandes for the ONE Bantamweight World Championship title. The native of Seoul, South Korea came up short, suffering his first pro loss in 12 fights via submission. Kim, though, headed back to the Kukje Gym with added confidence after going up against Fernandes, whom many consider the top bantamweight fighter in the world today. Prior to the setback, Kim had scored 10 consecutive victories, including five submission wins. During his ONE career, he has submitted both Kevin Belingon and Thanh Vu, which helped him earn the shot at Fernandes. Before signing with ONE, Kim claimed finishes against Yusuke Gondai, Kyung Ho Kim, Eun Ho Kye, Jae Gyeon Kim and In Suk Oh in his pro debut back in 2008. Okazaki is a veteran of the sport too, as the 36-year-old sports a record of 10-4 in his career. The Nakanoshima MMA Academy prospect competes out of Japan. This bout marks his fifth appearance with ONE, holding wins over Yusup Saadulaev via knockout and Josh Alvarez by rear naked choke. He made his debut with the top Asian promotion back in 2013, losing a decision to Fernandes. Last December, Okazaki was on the wrong end of another decision, falling to Belingon at ONE: WARRIOR'S WAY. He turned professional in 2004 and promptly scored decision wins in five of his first six fights. The lone exception was a 2004 draw with So Tazawa. After suffering his first pro defeat to former ONE title contender Masakatsu Ueda, Okazaki stormed back with two finishes among three fights between 2009 and 2011. With both of them boasting so much experience in MMA, this Japan versus South Korea fight is one you would not want to miss.